Any journey to the southwest area of Virginia should begin in historic Roanoke -- at the famous Hotel Roanoke, built in 1882. At the end of the 19th century, Roanoke was the major junction for many railways. A visit to the Virginia Museum of Transportation will tell you much about the city&apos;s rich rail heritage. Finish your day at the trendy Metro! and enjoy refined American cuisine in a stylish, metropolitan atmosphere. Make sure you save a full day for your journey to Betelgeuse! 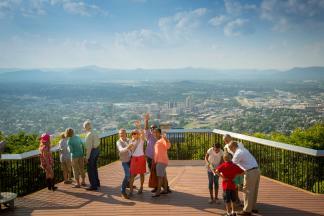 Luckily, Roanoke is one of the few cities in the U.S., crossed by two of the country&apos;s longest landmarks. 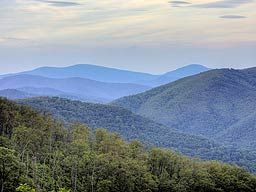 The Appalachian Trail winds through Roanoke on its 3,500 km route from Maine to Georgia -- a pleasure for diehard hikers and campers. For a quicker but no-less scenic route, one may prefer the Blue Ridge Parkway, another famous ribbon extending 755 km in Virginia and North Carolina. Take your time driving and pull over whenever you see a spectacular view. On your way, stop for lunch at one of Virginia&apos;s 160 wineries, following in the footsteps of Thomas Jefferson, one of the first winemakers of Virginia. A favourite spot is the Chateau Morrissette in Floyd, Va., where 18 wines, blended from more than 10 different varieties of grapes, can be tasted. Virginia, with over 3,000 acres of vineyards, ranks fifth in wine production in the States. Back on the road, you will face a twisty ride up the hill to Meadows of Dan where Primland resort stands, a unique playground named after the late French billionaire Didier Primat. You will witness a great sunset while having dinner in the Elements dining room at The Lodge. Select a good bottle from the 18-page listing of wines which rest in the 2-storey wine cellar. After dinner, get ready for some star-gazing as there is an impressive observatory attached to the boutique hotel. You will be amazed as the massive telescope transports you up to 27 million light years away with the knowledgeable guidance of the resident astronomer. the Betelgeuse star, part of the constellation of Orion, is a mere 640 light years away, a piece of cake! Following a night of sweet dreams, there is much more to discover on Primland&apos;s 1,2000-acre private grounds. Those not chasing birdies on the golf course may opt for deer hunting or hunting birdies of a different kind, such as gobblers, quails and pheasants. Other fun activities include clay shooting, fly fishing, walking, mountain biking, horseback riding as well as ATV riding. Of course your vacation would not be complete without a dip in the pool or rejuvenating yourself at The Spa. Following one of its numerous treatments, you will want to spend a long time in the relaxation room overlooking the 18th green. Golfers beware... you may miss your tee time should you decide to go for a pre-round treatment at the spa. You have been warned!